What’s remarkable is the way that the SEC wrote these rules. How much they draw from the crowd and how they’re framed represent another big change in how the SEC is open to working and that has implications for the future of the crowdfunding movement. The intermediaries, for their part, can be either traditional brokers, or else crowdfunding-only “funding portals” — a new legal category. In the latter case, they cannot handle money directly and also cannot recommend investments. But they are permitted to let users search, filter, and feature investment listings based on declared objective criteria. Wisely, the SEC also requires intermediaries to support open communication for the discussion of investments — a provision that had been in the original JOBS Act bill, but was inexplicably removed by the Senate. Looking at the SEC’s proposed rules as a whole, it’s impressive and refreshing to see a government report that’s so in sync with the crowd. We’re all in there, cited and footnoted, anyone who took the time to tell the SEC how they think Regulation Crowdfunding should work. This is what democracy looks like. The SEC gets it; they value the wisdom of the crowd. On October 23, the day the report was released, SEC Chair Mary Jo White wore a bright green blouse, like a “Go” signal, and said that she wants this new Regulation Crowdfunding market to thrive. I believe her. The portals, of course, will want to lower the cost of Regulation Crowdfunding by automating and scaling, creating a “Turbotax for Startups” experience in which all filings, signatures, audits, and other professional services are streamlined into the process. If they are successful in doing this, I predict that Regulation Crowdfunding should take off in its current form. But if it isn’t feasible, then it won’t — at least until the laws and regulations are changed. But even if the effort and expense of federal Regulation Crowdfunding doesn’t make sense for many businesses, a parallel movement at the state level, less well-reported but potentially more significant, is making it even easier for entrepreneurs in some states to raise investment money from the general public within their state. 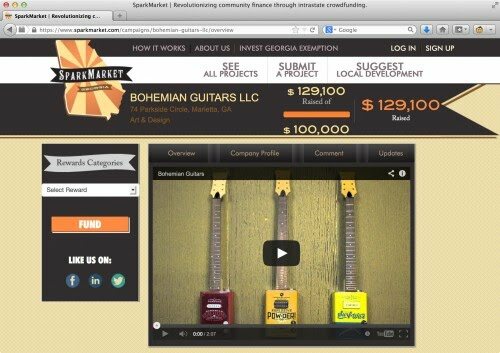 Crowd investment exemptions have already become law in Kansas (August 2011),Georgia (December 2012), and Wisconsin(November 2013), with the first successful raise completing last month, for Bohemian Guitars in Georgia, on the portal SparkMarket. Similar bills are currently before the legislatures in Washington, North Carolina, and Michigan, with Michigan expected to pass by the end of this year. I expect and hope that many more states will follow this trend.